Your three-year-old has been successfully potty trained for at least a year and things have gone very well for both of you. He's using the potty regularly and you're delighted not to have to deal with diapers on an ongoing basis - especially since the new baby is due any minute. After the birth of your second child a strange thing takes place, your older child is soiling his pants and not using the potty. It's more than frustrating and besides, you have enough on your plate - why is he doing this to you? Sound familiar? 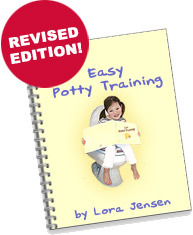 The facts are that potty training regression is not as uncommon as you may think. Of course, there are those kids who are trained and stay that way for the rest of their lives, but there are many, many children who, for a variety of reasons, regress. Most often it is stress taking its toll on the child. Adults are able to go with the flow and make adjustments to their lives in order to accommodate the ebb and flow of change from day to day. Little children have not yet mastered the tactic and end up becoming swamped in the emotional turmoil of change. They can't express it in terms for adults to understand, they only know deep inside their beings that things aren't the same and they can't always cope. If this happens to your child, save the frustration for another time and place. The last thing your child needs is an out-of-control parent yelling at him about being a bad boy. This is a good time to step back and take a look at your child's life over the last while and to figure out what happened to cause the regression. When it is a new baby, the cause is obvious and you can find creative ways to work through the emotional upheaval your child is facing. But, sometimes the cause is more subtle and less obvious, and your child can't explain it to you. So, you become the detective and find the reasons for yourself. There are myriad reasons for regression in toilet training. Some of them are: a recent move, a new baby either on the way or has arrived in their house, a change in childminding, a guest in your home who isn't leaving, tension between you and your spouse, change in regular schedules for work or school. All of these things create stress for a young child that he is unable to articulate. By spending some one-on-one time with your child, you may be able to discover the reason for the regression yourself. Your child needs more than discipline at this juncture. He needs affirmation and understanding. It is imperative that he knows he's not a bad boy and that you're not angry with him for the switch in his behavior. As you endeavor to find the cause of the regression, try playing with your child and keeping communication open and animated; he may give you the indications you need to understand his place in time. Often, when the child knows he is still loved and understood, he will make the effort necessary to return to the potty routine. Always, it is important as a parent to know when to seek help as well.